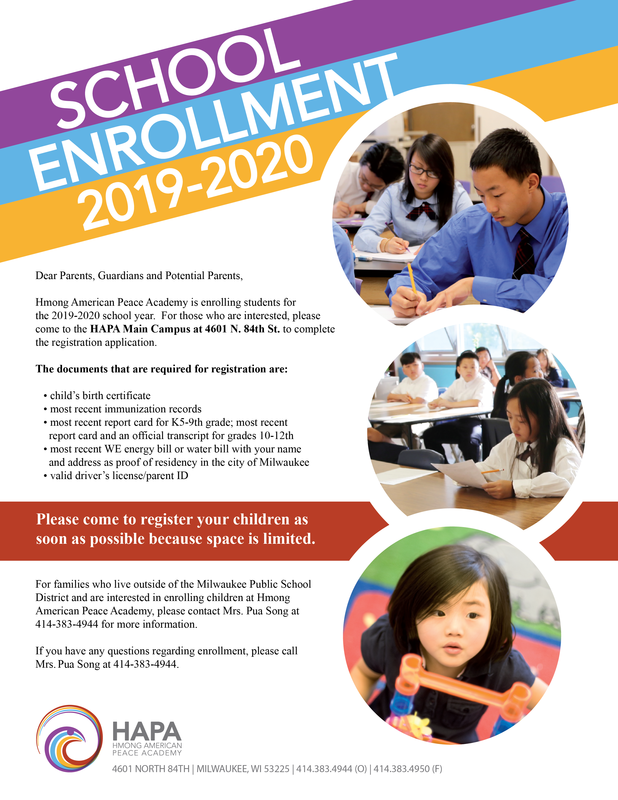 One of our goals at the Hmong American Peace Academy is to enable all students to receive a quality education. Good attendance will help us accomplish that goal. If your child has to be absent, please call the school office at 383-4944 to report his/her absence by 8:30 a.m. If your child is ill, please keep him/her home. If it is something communicable (chicken pox, strep throat, etc. ), we would appreciate a call so the classroom can be notified. Also, if you know your child will be absent for an extended length of time (example: hospitalization, out-of-town funeral, etc. ), please let us know in advance, if possible. It is very important that a written excuse with the date(s) and reason for absence is sent to school when your child returns. If a written excuse is not received by the school within 72 hours of the return of your child from an absence, your child will be considered truant and it will go on his/her permanent record. We will also send a letter home to you. If your child should accumulate five truancies, he/she would be considered habitually truant and we are required to visit your home and report it to the District Attorney. The education of your child is extremely important to us. If you have any questions, please contact us at 383-4944. Thank you in advance for your cooperation.